Giveaways, whether through Goodreads or the author, or another way, have pros and cons to it. Giving away books just to give away books? 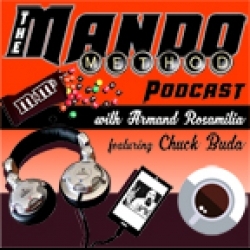 The Mando Method Podcast co-hosts Armand Rosamilia and Chuck Buda discuss.Then Erin Sweet Al-Mehairi chats about blogging during her Marketing Morsels segment, followed by a rousing hot apple pie eating contest.